Buy 96 or more for $1.89 each. 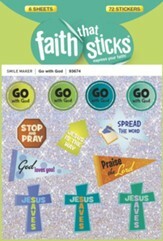 Declare your faith with the Faith that Stickssticker collection! 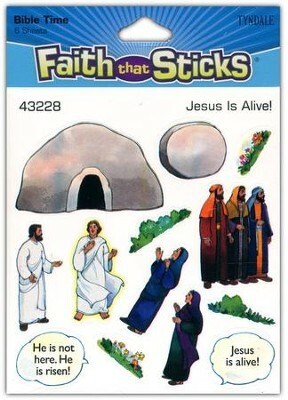 Kids will love this collection of stickers telling the Easter story and the resurrected Christ. Each sticker sheet includes an empty tomb, the stone that was rolled away, Jesus, an angel, the women who visited the empty tomb Easter morning, shrubbery, and the disciples-with talk bubbles: "He is not here. He is risen!" and "Jesus is alive!" Perfect for Easter craft activities! Six sheets, 13 stickers per sheet; 78 stickers per package. 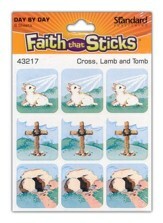 These stickers help you tell children the story of Easter and the resurrection of Jesus. Each sticker sheet includes an empty tomb, the stone that was rolled away, Jesus, an angel, the women who visited the empty tomb Easter morning, shrubbery, and the discipleswith talk bubbles: He is not here. 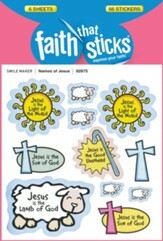 He is risen! and Jesus is alive! Six sheets, 13 stickers per sheet; 78 stickers per package. I'm the author/artist and I want to review Stickers: Jesus Is Alive.